It is 1942 and life in London is a daily ordeal. Blackouts, bombs and The Blitz. Although Matthew Bugg’s musical, “Miss Nightingale”, is set among the hail of enemy bombs it actually concentrates more on the ‘enemy within’; a phrase coined to describe the plight of homosexuality at the time. In an atmospheric, and perhaps overpromising opening scene, two men share a cigarette and exchange sexual promises in the shadows. They, rather than the bombers overhead, are the target of the searchlights, and in a similar way Bugg has narrowed the focus to create a very human story in the heart of our war-torn capital. 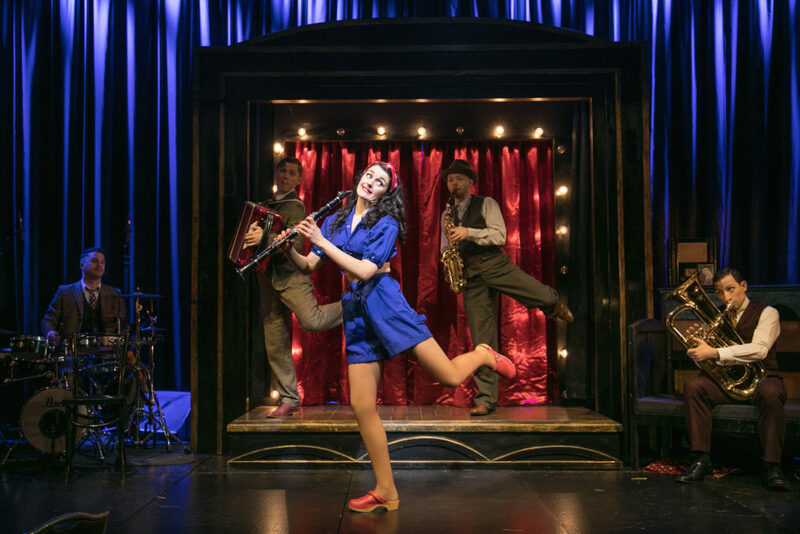 Maggie Brown is a nurse and aspiring singer sharing a flat with George, her song writer and a Jewish refugee who still pines for the uninhibited world of 1920s Berlin. With unlikely swiftness they secure a gig at the newest nightclub in town, owned by the socialite Sir Frank Worthington-Blythe. Maggie’s beau Tom re-christens her ‘Miss Nightingale’ and the musical duo become a West End hit. But their success and happiness are threatened by secrets, blackmail, betrayal and forbidden love. The programme cites Bugg as the writer, director, producer and he is also in the cast and plays piano, saxophone, violin, clarinet and double bass. Clearly it is a labour of love and with that comes the inevitable label of ‘vanity project’. It clearly isn’t, though, yet it could benefit from an outside eye, particularly as it has been doing the rounds for quite some time now. The story is thoroughly engaging but the dialogue frequently touches on cliché, and complexities of character are often lost in innuendo. But any shortfalls in the book are compensated for by the score and the sweeping enthusiasm of the actor musicians. Lauren Chinery, as the eponymous Miss Nightingale, is the show stealer; acting, singing, dancing and playing saxophone and clarinet in a blaze of a performance; all with a twinkle in her eye that tells the audience she is loving every minute. She is in great company too, with a close-knit quality to the cast that make this production a joy to watch. Matthew Floyd Jones, as her gay best friend George, gives a moving portrayal of a man struggling with illicit love, effortlessly slipping into song, particularly during solo numbers; ‘I’ll Sing For No One But Myself’ and ‘Mein Liebe Berlin’ which puts us right in the heart of the world of ‘Cabaret’. Where the first act lacks any real sense of danger, the second act comes into its own and the slapstick gives way to the drama we have been waiting for, poignantly reminding us too of what it was like to be a gay man before the decriminalisation of homosexuality. Bugg excels at bringing these characters together with a cast that re-defines ‘triple threat’. When not in character each multi-instrumentalist cast member becomes part of the mini-orchestra. This is ultimately an uplifting piece of musical theatre that boosts morale in the spirit of the time it is set. The underlying sub thread of the war-time narrative is that there’s nothing like the threat of death to make people determined to get the most out of life. Likewise, this show, that has supreme potential, still needs to navigate some of the obstacles that lie in the way of the long life it deserves. But I have little doubt that this particular cast, whose own morale needs little boosting, can help break the barriers.